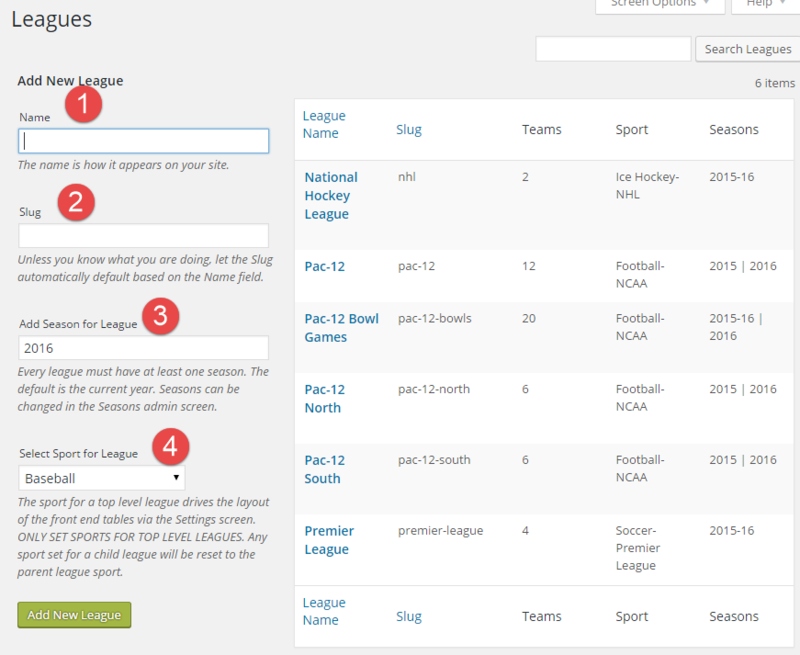 The Leagues screen is the first stop when using the plugin. Without at least one league, nothing happens. Leagues are not “hierarchical” on this screen, but design of the site’s leagues should be considered carefully. Based on the chosen setup, league standings and schedules can then be displayed very flexibly since each shortcode accepts multiple leagues. Generally speaking, add only the lowest level leagues. For example, one might add the lowest level leagues for the NHL: Atlantic, Metropolitan, Central, and Pacific. Schedules can then be displayed for each of those leagues, the Eastern and Western Conferences, and the entire NHL. The primary data fields are described below and annotated in the screenshot. Name. A league name MUST be provided. It is not displayed on the front end. Slug. (Optional) The plugin will create a slug based on the league Name. If the league name is “National Football League”, one may choose to use “nfl” as the slug instead of “national-football-league’, which is what will be created by the plugin. Add Season for League. (Optional) Every league MUST have at least ONE season. More can be added on the Seasons screen. By default, the plugin will create a “current year season” if this field is blank. For example, “2015” or “2016”. Select Sport for League. This entry drives the default Settings for the standings and schedules shortcode displays. These settings can be changed for each sport on the Settings screen, but every league with a given sport will have the same settings.